Critical to successfully capitalising on the incredible asset an organisation’s data represents is the creation of a data strategy and roadmap — and key to achieving that is an effective analytics plan. A successful data project plan should be considered in the context of aligning analytics priorities with desired business outcomes and will include the following components: data content, quality, performance, roles & responsibilities, systems integration, migration, security & privacy, software, measurement and communication. 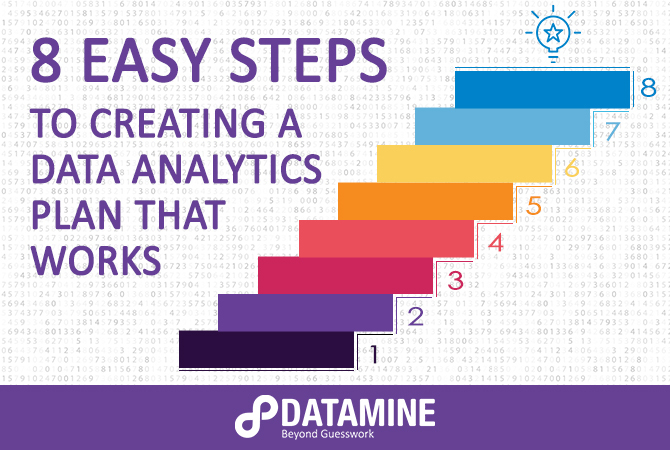 The following eight steps detail how to approach each component to create an analytics plan that will quickly deliver results. What data do you collect and what other relevant data can you access (census, voter rolls etc.)? Build on the basics — name, email, D.O.B for example, and purchase info like policy type, price, and purchase channel (broker, website, mobile device etc.). The reality of most data is that it is constantly evolving. Policies end, customers move — in short, things change. Decisions, therefore, need to be made on your requirements for data ‘currency’ — and the processes you’ll implement for updating and review. Typically, the more up-to-date, the greater the cost, so there needs to be a reason for requiring real-time updates. Performance evaluation includes both data and people. What is your technical capacity and will it need to grow, what software and licenses will be required? Your systems will need to be monitored, so decide who will do that (in-house or contracted?) and what response times will be necessary. Staffing requirements during the initial build will differ from that required for on-going maintenance. You’ll probably need a Database Administrator, Developers, Business Analysts, Modellers and a Project Manager. Are they on staff or will you outsource? Wherever they are, they’ll have to take ownership. Data will need to flow from your existing systems to your datamart (central data repository, see the video below), so they’ll have to be interfaced and you’ll need a systems integration specialist. Also, only migrate the data you’ll need. Ensure you’ll be compliant with any relevant privacy laws and define the security arrangements for your datamart. Backup frequency will depend on the frequency of updates and a disaster recovery plan should be implemented and tested. Before your datamart is up and running you’ll need to decide what to measure and why. Start by considering desired outcomes. How much system admin resource will it consume? Who will be using it and how often? Your important KPIs should all be measurable - and your performance optimised as a result. Once your data plan is complete it needs to be communicated to management and users. Make sure everyone understands the purpose behind your datamart and its functionality so that expectations are managed – and don’t forget to brief new team members as they join your organisation. Sally Carey is a director of Datamine and has over 20 years experience consulting on data analytics solutions across a range of industry sectors. Carey specialises in delivering clarity from the complexity of big data – advising organisations on a host of predictive analytics disciplines - including quantitative decision making, loyalty programmes, organisational change and marketing strategy.